Successfully Added SATA Hard Drive Docking Station - External HDD SATA Dock to your Shopping Cart. 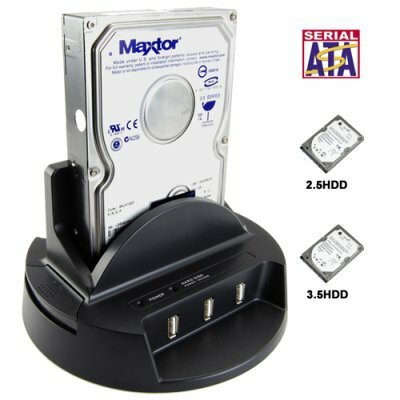 New external SATA hard drive docking station for easily adding and addition HDD to your computer. Now you can instantly add more storage to your computer system and even hot-swap multiple disks. How does it work? Simply place your 2.5 or 3.5 inch SATA hard drive into the docking station, connect the USB 2.0 cable, and then you are ready to go. Yes, it is as simple as that! You can finally hot-swap hard disks just like you can with SD cards and USB thumb drives - giving your system literally endless storage potential. Backing up your valuable data or moving information from one computer to another has never been easier. Backing up your computer data is crucial these days, losing the family digital pictures and personal music + video collection would be a huge loss. So whether you need more data storage space for your home or office computer, this SATA HDD docking station makes it easy to simply add the additional disk space you need. SATA hard drives are the cheapest (per GB) and fastest storage medium available today. For the price you would pay for a 64GB USB flash drive you can buy a 500GB SATA HDD. That is almost 10x as much space for the same price! Simplify your life, save time and money with this valuable new computer add-on product.